LSUS presents “The Woolgatherer,” a play written by William Mastrosimone and directed by Mary Jarzabek, instructor of communications, says Jennifer LaPierre. The play features two LSUS students: Audra Caitlyn Moss as Rose and Eric Whitt as Cliff. The comedy-drama centers on Rose, a shy five-and-dime salesgirl whose life is full of reveries and daydreams. Into her life saunters Cliff, a hard working, hard drinking, hard talking truck driver. He is rough and witty and just as starved for love as she is. Due to mature themes and language, this production is recommended for those 13 years old and older. Performances are scheduled for March 7, 8, 9, 14, 15 and 16 at 7:00 p.m. in the LSUS Black Box Theatre in Bronson Hall, Room 111. Tickets are $10; $5 for students, senior citizens, military and groups of five or more. 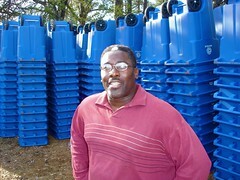 Says Lee Jeter of Shreveport Green, "We're taking delivery today of some 66,000 recycling bins. They are destined for distribution to houses across Shreveport during the June to August period; that's the target date." Participating in the delivery were members of Americorps and Jon Soul of Shreveport Green. Shreveport Green's site explains, "Pratt Industries, the world's largest paper and packaging company, has begun preparations to occupy 85 acres at the Port of Shreveport-Bossier. It is because of this that Shreveport can finally look forward to curbside recycling. The city will pay a fee of around $3 million for the 66,000 recycling bins that residents and businesses will receive to collect their recyclables, such as milk jugs, newspapers, and soda cartons. The bins can then be set out on regular trash days while employees of Pratt Industries will sort the recyclables and take them to their paper mill, where they will either be converted into paper or sent out to be recycled. For now, Shreveport residents won't expect to pay anything for this new service, but in 2011 the city will begin charging a monthly fee of $2.50. This is an easy price to pay for the massive amount of trash that will be saved from our growing landfill, and the positive impact we will have on the environment." Among the many handsome lads and lasses gathered by Shreveport Opera for their production of the Marriage of Figaro is Christine Marie Heath; she is to sing the role of Susanna. 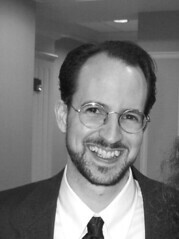 Typical of the hard-working singers onstage Sat night at Riverview Theater, Heath has sung with companies including The New York Gilbert and Sullivan Players at City Center, Sarasota Opera, Toledo Opera, Natchez Music Festival, Ashlawn-Highland Opera Festival, and Ohio Light Opera. Internationally, she has performed with Teatro Lirico di Cagliari in Sardinia, Italy; a Sondheim revue at La Gran Theatre del Liceu in Barcelona, Spain; and the title role of Evita sung entirely in German at The Musik Theater Chur in Switzerland. Tickets and more at shreveopera.org. Angelique Feaster writes, "Join the Mahogany Ensemble Theater for our 3rd season opener, The Madam CJ Walker Story, an inspiring drama about the dreams of Louisiana native Sarah Breedlove who became the first known self-made African American woman millionaire. This historic play, infused with uplifting song and dance will touch, move, and inspire audiences of all ages to follow their dreams with faith and determination." Tickets: $15 adults, $10 seniors and students, $5 children 12 and under; Group rates: $7(adult, seniors, students 13 and up) for groups of 10+. For tickets visit Pamoja Cultural Art Center-3806 Linwood Ave.
For reservations call the box office at 318-745-ARTS (2787). Four members of Cirque du Soleil will make two special appearances at Sci-Port Discovery Center this weekend, says Eric Gipson. 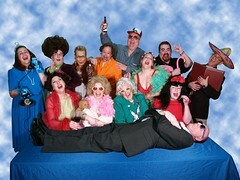 They will do the Mad Scientist Ball fundraiser, which is Fri, Feb 29, from 7 to 11 p.m. They will spring for the public Sat, Mar 1, from 1:30 to 2:30 p.m. The performers are part of the Saltimbanco Bus, a troupe of street performers who are traveling the country to announce the upcoming engagements of the U.S. Saltimbanco tour; the big show will be presented at CenturyTel Center on March 8 and 9. Theme of the Mad Scientist Ball is Castles & Constellations; it includes a variety of cuisine, an open bar, silent auction, music by the bands Identity Crisis and Intuition, and a karaoke stage. A limited number of Saltimbanco show tickets will be given out during the course of the ball. Dress is tuxedos and tennis shoes. Tickets are $100 and proceeds support Sci-Port’s education programs. The Saltimbanco appearance at Sci-Port is included with regular Sci-Port admission ($12 adults, $9 children, seniors and military) and free to Sci-Port members. Join the Robinson Film Center and bon vivant Chris Jay at La Boardwalk for a one night-only presentation of the Academy Award-nominated film The Savages, starring Laura Linney and Philip Seymour Hoffman. Thurs, March 6, 7 pm at the Louisiana Boardwalk Regal in Bossier City. Tickets are now on-sale and may be purchased in advance by calling (318) 424-9090. "At Dance Theater of Harlem we believe the arts ignite the mind," said Endalyn Taylor, NYC dancer (Carousel, Lion King, Aida) and Dance Theater of Harlem faculty member. 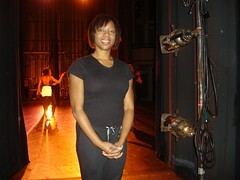 She addressed the crowd at the Strand Theater, Shreveport, during the La Dance Alive concert produced by Carol Anglin and Louisiana Dance Theater. 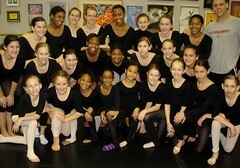 She added, "This week I am here to audition intermediate and advanced dancers for the 2008 summer intensive program." Taylor introduced Ashley Murphy, La Dance Theater and Caddo Magnet HS alum. 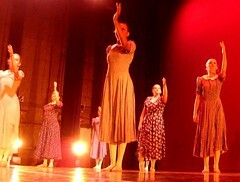 Murphy is today a member of the Dancing Through Barriers Ensemble at Dance Theater of Harlem. Info on auditions for the summer program: 318-861-3006. The Monty and Marsha video "Mudbugs and Zydeco," which features Shreveport's Mudbug Madness Festival, is the first to reach 500 views on the new www.compulsivetraveler.tv website, writes Monty Brown. Brown notes that it is nearly 100 views ahead of its nearest competitors in the USA section. Compulsive Traveler, he says, has an occasional show on CBS and an ongoing competition for short travel videos, open to all. Also a pip for the Browns: the Monty and Marsha video "Stonehenge, etc.," is the most watched UK video. 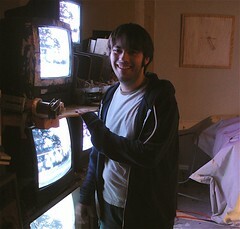 Salt Dreams is a documentary film by former Shreveporter JT Nesbitt. It's about JT and a small band of New Orleanians who embarked on a 2000 mile trek in an attempt to set a land speed record at the Bonneville Salt Flats. It features The Car, aka the Stinkin Linkin. It was a 1998 Lincoln Mark 8 destroyed by the floodwaters of Hurricane Katrina. It is transformed into a race car by the friends. They become "The New Orleans Race Team," competing on an international level, not just as individuals, but as representatives of the last Bohemia in America, says Nesbitt. Their story is one of loss and redemption in the midst of violence and tragedy, and of a community struggling to redefine its identity. It is a story of Nesbitt, a gifted painter and motorcycle designer trying - defying common sense - to make a living in New Orleans. Premier of Salt Dreams: Wednesday April 2, 2008, One Eyed Jacks, 615 Toulouse St. New Orleans, La. Show times: 1st show 8:00pm then music from soundtrack featuring My Graveyard Jaw, Domenic, Noisician Coalition et all. 2nd show 12 midnight. 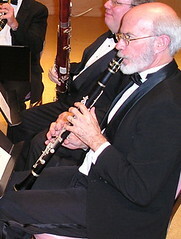 LSUS will host a woodwind quintet concert Thurs, Feb 28, 2008 at 10:30 am, says aWanda Blakeney. The music will take place in the Black Box Theatre located in Bronson Hall, Room 111. The concert will feature music of two artists: Latin jazz artist and composer Paquito d’ Rivera and Argentinean Tango master Astor Piazzolla. Performers are Sally Horak, flute, Theresa Zale Bridges, oboe, Thomas Phillips, clarinet, Anne Marie Power, bassoon, and Thomas Hundemer, horn. For more information on the concert at LSUS, contact Dr. La Wanda Blakeney, assistant professor of music, at 318-797-5051 or LaWanda.Blakeney@LSUS.edu. Orchesis Dance Theater from Grambling, Impulse Dance Theater from the Louisiana School for Mathc, Science and the Arts and the Dancing Through the Barriers via Dance Theater of Harlem are on the bill Mon, Feb 25, 7:30 pm, at the Strand Theater, says Carol Anglin. The celebrated duo of Ashley Murphy and Samuel Wilson, NYC, are also scheduled to perform. Wilson, however, injured a foot in practice Sunday. It was not clear Sunday night whether he would be able to dance in Monday's program. Among the guest artists assembled in Shreveport by Anglin as choreographers include Jon Ledehr, NYC, Diane Maroney-Grigsby, Grambling and Endalyn Taylor, Dance Theater of Harlem. Shreveport Little Theater Academy (SLTA) is a new institute for the region, says Robert Darrow. The SLTA, designed for ages 12 - 22, is to be held from June 30 to July 27. The summer Academy will include a 2008 production of Disney's High School Musical. SLTA hours: June 30 to July 12, Mon - Sat, 10 am to 6 pm. July 14 – 27 will be production specific and hours may vary. All classes will be taught by faculty who are accomplished, professional theatre artists and educators. Staff members will include education director Mary Alfred Thoma, director and designer Jared Watson, choreographer Laura M. Beeman, music director William Parsons, SLT’s managing and artistic director Robert Darrow. In addition, guest artists, including director/acting instructor Mary Joris, and New York director/actor Stuart Landon, will present workshops during the Academy. “The Hanging Garden,” a solo exhibition by artist Kenn Kotara, opened Th, Feb 21 at Turner Art Center Gallery, Centenary College, says Bruce Allen. an ongoing series titled Barbe Espagnole (Spanish moss), which explores the metaphorical potential of Spanish moss and reflect Kotara’s Louisiana & Southern roots. 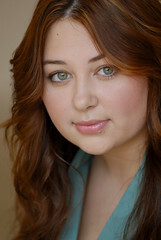 Kotara received a BFA and an MFA from Louisiana Tech University. His artwork is in public and corporate collections such as the Asheville Art Museum, Louisiana State Museum, Masur Museum, Bellagio Resort - Las Vegas, Ben Carter Properties - Atlanta, Nieman Marcus, Sumisho Hotel - Tokyo, U.S. Embassy - Jamaica, and Wachovia Bank Charlotte. Kotara lives in Asheville, North Carolina with his wife and son. Turner Gallery is located at 3000 Centenary Blvd. It is open week days from 10 am to 5 pm and weekends from 2-5 pm. At the Actor's Cafe myspace page it says, "We are a restaurant and bar located at 1401 Fairfield Ave, the former location of Bear's. Our goal is to provide a fun atmosphere where musicians, actors, artists, and the public can showcase their talents while enjoying tasty food and a full bar. Thursday Actor's Showcase: try to perform a monologue - or dialogue - for five minutes without getting the gong. At least one winner every night. Free beverages for contestants. Fun atmosphere. Over a period of 8 contests we will see who's the best. Movie casting directors will choose the winners, who will win an agency contract and photo shoot. Starts at 8 pm. Sign up early." Monday. Dan Garner of the Tipitina's music co-op brings his popular Singer/Songwriter Jam to the Café. 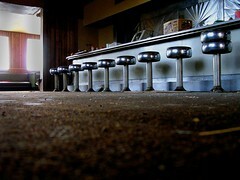 This had quite a following at the now defunct Java Junction. Tuesday is when signed Acclaim actors gather to do scenes for upcoming movie auditions in the back room. Wednesday musicians gather for the Music Jam. It was smokin' last night and lasted 'till midnight. All good musicians welcome. 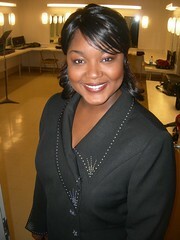 Fri and Sat last week Alana Dyson sang "Black coffee"and Shreveport Bellydancers shimmied. The deadline for the Louisiana Film Festival - Student Division has been extended to next Friday, February 29th, says Michelle Glaros. See more at lafilmfest.org. Shreveport Little Theatre will present the comedy Dearly Departed March 13, 14, 15 at 8 p.m. in the University Center Theater at LSUS, says Robert Darrow. It features Betty Baker, Joe Todaro, Lily Whitaker, Marcia Cassanova, John Daniel, Travis Miller, Alan Mathison, Butch Bellah, Valerie Perdue, Rebecca Gorham, Patrica Davis, Paula Brown, Don Weathersby, Sonia Lowe, and Frances Bryant. Director is Robert Darrow. 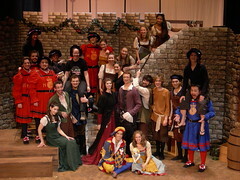 Production crew includes Debbie Hicks, scenic painting, David White, lighting design, and David Anderson, sound design. Tickets are $15. for adults and $13. for students, seniors, and active military. SLT’s box office at 812 Margaret Place, open from noon to 4:00 p.m., 424-4439. "Attention, folkies," writes singer Sandra Odom, "It's House Concert time again. I met Doug & Telisha Williams at Folk Alliance last year hanging out with The Laws and Jeff & Vida, who you've had the pleasure of seeing at our concerts before. They are one of those acts that does everything different than you expect. Telisha plays the big stand-up bass and sings lead with a sweet country twang then turns around cradling a mandolin. Doug is a kickin' writer with a story to tell. night away. Don't forget to email or call so we know how much food to get." 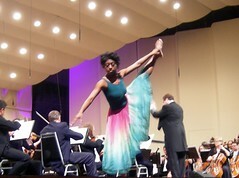 - Endalyn Taylor, DTH School Director, who will conduct auditions for the Harlem-based school. Tickets are $25/$20/$15 and are available at the Strand Theatre Box Office (318) 226-8555. Jayson Bales, a stellar performer in the roots and Americana genre, is returning to Shreveport to play Sharpies alongside Russ Brabham and Hominy Ranch. The show begins at 7 pm Fri, Feb 22. 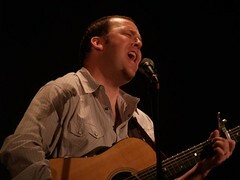 Photo of Bales performing at Fairfield Studios, Shreveport, by Barbara Beaird. Shreveportbossierfunguide.com: is your organization signed up for free lisitings? Your arts or tourism organization will get free event listings on the new Shreveport Bossier Fun Guide website - if you are signed up - says the Shreveport Regional Arts Council. Scheduled to launch this Spring, SBFG is going to look like phillyfunguide.com or nolafunguide.com. To submit a profile - which must include a digital photograph of you, your work or an event - complete this online form at ShreveportBossierFunGuide.com/addus. Your photo must be smaller than 300KB. If you need help with resizing an image, please call or email us. If you have already submitted a profile, and are not listed below, please call or email us as soon as possible. Non-profit and for-profit organizations will be able to submit professional arts, cultural, entertainment, sports and recreational events that are open to the general public. See eligibility requirements below. For more information email wendy@shreveportbossierfunguide.com (318) 869-0609 or Pat pgill@sbctb.org (318)222-9391. Jerry Wray (juried artist), J.Bennett Johnston Regional Visitor Center, Jack Binion's Steak House, Jeannine Pasini Beekman, Storyteller (juried artist), Joanna Ballard, Louisiana Storyteller (juried artist), Karpeles Museum, Kermit Poling (juried artist), Louisiana Dance Foundation/Louisiana Dance Theatre, Louisiana Film Festival – Student Division, Louisiana Folklife Center, Louisiana State Exhibit Museum, Louisiana State Oil and Gas Museum, Louisiana State University in Shreveport Theatre, Mahoghany Ensemble Theatre, Mary Virginia Hill (juried artist), Meadows Museum of Art at Centenary College, Michael Graham (juried artist), Multicultural Center of the South, Municipal Memorial Auditorium of Shreveport, Nadine Charity (juried artist), Natchitoches-Northwestern Symphony, Neil Johnson Photography (juried artist), North Louisiana Woodcarvers, Inc., Northwest Louisiana Master Gardener Association, Northwestern Chamber Choir, Northwestern State University A. A. Fredericks Center for Creative and Performing Arts, Northwestern State University Concert Choir, Northwestern State University Wind Symphony, Northwestern Theatre and Dance Department, The Dear School for the Creative and Performing Arts, Performing Arts Center @ First United Methodist Church, Performing Arts Studio, Inc., Peter Pan Players, Pioneer Heritage Center - LSUS, Playaz and Playettes, Inc., R. W. Norton Art Gallery, Rachel Stuart-Haas (juried artist), Ren Ten Music, LLC, River Cities Jubilee Chorus, River City Antique Mall & Collectors Market, River City Repertory Theatre, Riverdome, Riverview Theater and Riverview Hall, Robert Trudeau (juried artist), Robinson Film Center, Ron Hardy aka Tarumbae (juried artist), Sankofa Vision, Inc. School of the Performing Arts, Sci-Port Discovery Center, Shreve Memorial Library (Main Branch), Shreveport Little Theatre, Shreveport Metropolitan Ballet, Shreveport Opera, Shreveport Public Assembly and Recreation, Shreveport Regional Arts Council, Shreveport Sports Baseball Club, Shreveport Symphony Orchestra, Shreveport Water Works Museum, Skydive Louisisiana, Southern University Museum of Art at Shreveport, Southfield School, Spring Street Historical Museum, State Fair of Louisiana, Talbot Hopkins (juried artist), Tama Ripps Nathan (juried artist), Theatre of The Performing Arts, Tipitina's Music Office Co-Op/Shreveport, Tony Reans (juried artist), Trapped Truth Society, Turner Art Center Gallery, Centenary College. Organizations that produce professional cultural entertainment including art, cultural, sports and recreational events that are open to the general public in the 10-parish NWLA area. Adult entertainment, including gaming will not be accepted. Events that promote religion or religious philosophy will not be accepted. Events that are not offered to the General Public will not be accepted. Artists will be paid to become a part of the largest public art project in the history of Caddo Parish, says Traci D Howerton. Over 100 large, uniquely decorated, fiberglass catfish sculptures will be on display across Shreveport and Bossier City for several months beginning in the summer of 2008. We need you to bring these sculptures to life, says Howerton. 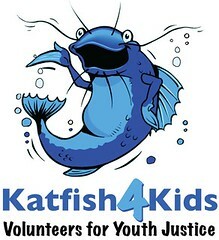 At katfish4kids.com artists can download the Artist Submission Form, Artist Information Packet and Artist Prep & Paint Packet. Friends of the late Frances Drew led by Jamelah Al-Amin of PAMOJA Art Society and Pam Atchison of Shreveport Regional Arts Council are meeting at Artspace Shreveport on Sat, Feb 23. They will form a Frances Drew story circle during the 1 to 4 pm memorial session. Drew passed away at her Egan St home in Dec, 2007. Art work by Drew loaned by visitors to the Artspace event will be assembled in an exhibit which will be on display from Fri, Mar 7, to Fri, Mar 21. 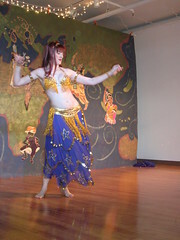 On her ShreveportBellyDance myspace, Berry says "I began studying belly dance in 1997. I started out with several different teachers in the San Franciso Bay Area. Since 2001, I have been in Louisiana and have kept up with teachers from Texas, Illinois, California, and Colorado. I also teach private lessons. Private lessons can be shared in order to cut down on individual cost. Please contact me to arrange private (and affordable) classes (or events) for you and your friends. C. Mark Burt works in textured, detailed pen-and-ink drawings and oil paintings. 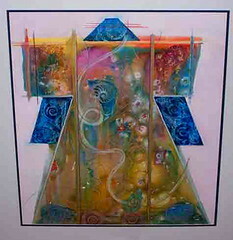 His cosmos is influenced by Lee Baxter Davis, one of his art professors from Texas A&M at Commerce. 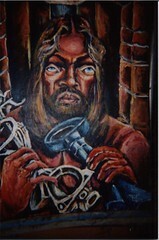 Davis originated a school of art called The Lizard Cult in the 1970s. In May Burt was included in a Lizard Cult show at the Clementine Gallery, NYC. Burt will present an evening of discussion and display of his art - he calls it Bowl of Nuts - at Bossier Arts Council on Fri, Feb 22, 6:30 to 7:30 pm. Doors open at 5:30. Info: Danielle Reans, 465.7773, and Bossier Arts Council, 741.8310. "I paint and draw horses because I see beauty that absolutely must be expressed," says artist Angela Celeste Rice. "There is a fantastic anti-gravitational nature about the locomotion and suspension in the movement of horse. The interaction between professional trainers and their talented equine athletes is a communication that can only be described as centaurian." Rice is a recent graduate of Stephen F Austin Univ who describes herself cryptically as "born on a bayou; raised on the back of a horse." Rice rides horses both politely as well as in the rodeo, therefore she knows what she calls "the finesse of educated hands on reins and the reciprocation of their body movements between the two animals, horse and human." 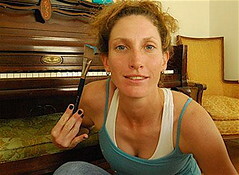 As a talented and edgy painter and photographer she will show a range of work. In her web site the Soylent section concerns "work generally inspired by the media, government, any issues concerning the world as well as work with people as the subject." Her illustrations reflect her generation's taste for the lurid and satiric. The Rice opening runs concurrently with the Thursday Night Trolley experience. The art and history tour that is called the TNT has proven a popular draw for Shreveport regional Arts Council. It is free and lively. Percussionist Aaron Butler, formerly with Dirtfoot and the Peekers, among many groups, says coming to Shreveport with bluesman Brian Martin "will be my first gig back since I've moved on to Arkansas. 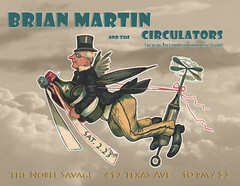 I'm playing percussion in Brian Martin's new band, The Circulators. 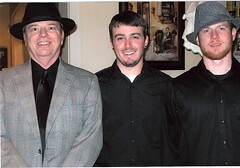 The group also consists of Kenny Tillery on bass and Greg Batterton on Harmonica/Trumpet." Martin and Butler come with good news: "We also just won the third round of the Arkansas Times Musician's Showcase. The finals are Mar. 7th at the Rev Room in Little Rock." Show starts at 10:00 on Sat, Feb 23, and costs $3. 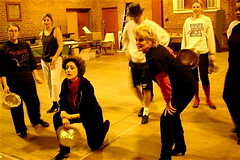 Nine women and one man in a dance studio, inhibitions amok, are the basis for the comedy called Stepping Out. It is the season opener for River City Repertory Theater. Patric Williams, artistic manager of the Actor's Equity-sanctioned company, is director. 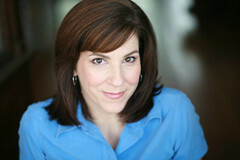 Seva May plays Mavis, the dance teacher. Her class is comprised of some of the area’s most admired actors: Sherry Bouche, Janin Pou, Jodie Glorioso, Bonnie Gillen, Charity Schubert, Pat Maxey, Angelique Feaster and Jenni Loer. 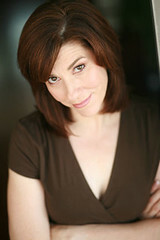 Peggy Byers plays Mrs. Fraser, the cantankerous rehearsal pianist. Bouche and Byers are Equity actors. McWilliams said this week,"Our weekend shows are doing great business but we're trying to get Shreveport audiences attuned to a different performance schedule - meaning earlier in a week." Teen potters, painters amd mixed-media artists will fill Prima Tazza, 8835 Line Ave (adjacent to Outback Steakhouse) on Fri evening, say teachers Shirlene Alexander and Holli Hennessy. From 6 to 7:30 pm there will be a gathering of some of the city's most avid young artists and supportive art teachers in the Prima Tazza gallery. Expect adjunct teachers such as Laura Noland-Harter and Marabella Dunn, Caddo art superviser Henry Price and ArtBreak manager Julia Foley. Too, expect a melee of color, media and forms from the teens. 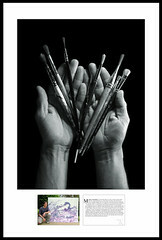 Pencil, crayon, scratch board, acrylics and batik are among the myriad media. Raku and bisque bowls and platters will be on view, too. Some have been painted in homage to the great 20th century artists, says Hennessy. The work will remain on view through Feb 29. Says guitar slinger Will Maranto, "Retroverb is playing Friday night on Texas Street - at Harlequin Alley, 516 Texas, to be exact. We’re looking forward to getting back into the swing of things after a nice long break. 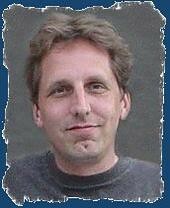 The band is also happy to welcome our new drummer, Mr. Richard Lea, into our ranks. He’s been a fine addition and is an all-around nice guy. India: Kingdom of the Tiger, a big-screen film showing the myriad landscapes, animals and people of a colorful land, will show one weekend only at Sci-Port Discovery Center’s three story IMAX Dome Theatre, says Eric Gipson. It airs on Sat, Feb 16, and Sun, Feb 17. 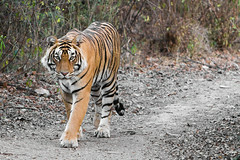 India: Kingdom of the Tiger is guided by the tale of Jim Corbett, the son of a British postman, who became famous in India as the hunter of man-eating tigers. He was also a photographer and conservationist, and soon found his way into hearts as India’s first tiger conservationist and as a well-loved writer. Running time is 42 minutes. IMAX ticket prices for the February 16-17 double feature weekend are: $ 8.50 General Admission, $ 7.50 Children (3-12), Seniors and Military, and $ 7.00 Groups 15+. (318) 424-3466 or toll-free (877) 724-7678; or visit Sci-Port’s website at www.sciport.org. Shreveport Opera believes it has the perfect gift for your sweetie: tickets to The Marriage of Figaro, a comedic love story. The opera is Sat, March 1, 7:30 pm. Ticket prices range from $10 (hmm) to $75 (ahhh). (318) 227-9503, 8 to 5 pm. "Buddy Flett is recovering on schedule," says Bruce Flett of the Bluebirds. "He was hospitalized for "fluid Imbalance" and low sodium a week ago. The hospital wants him to rest, so the family has requested no visitors." Shreveport, LA 71134." Adds Bruce, "He's gonna be fine, just needs to take it easy to come back to 100%. We appreciate your thoughts and prayers. He's supposed to be in Calgary, Canada, the end of February and in Italy on March 8 with Hubert Sumlin." Meanwhile the Bluebirds have picked up vocal and guitar help from the phenomenal Jimmy Wooten. 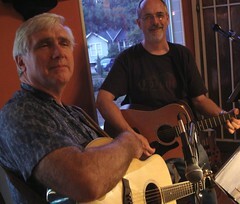 The Bluebirds will be performing Tuesday, Feb. 12, from 7 - 11 pm at Horseshoe's Riverdome Bar. Wolfgang Hinck, PhD, has a Myspace.com page that is unabashedly, well, hot. As well as thoughtful. Porsches, house, global travel, chicks and sunglasses. You want high-energy marketing? Hinck knows it and teaches it at LSUS. Hinck's views on eMarketing will fly downtown on Wed morn at Artspace when the Shreveport Regional Arts Council hosts the February Attractions Association meeting at 10:00 am, Feb. 13th. SRAC is managing the birth of a digital entity called ShreveportBossierFunGuide.com and along with the Shreveport Bossier Convention and Tourist Bureau and other partners, are making sure the SBFG is a magnet for regional arts and entertainment. To ensure that the delicious eMarketing possibilities that lie in the advent of the SBFG are not ignored, SRAC has planned numerous workshops and seminars, including the talk by Hinck. Artist process, please see Shrevearts.org at Resources / Forms. Artspace presents the opportunity for gaining insight into the work on display in Experiments in Color on Tues, Feb 12, 4 pm, when a gallery talk will be presented, says Leigh Elgin. 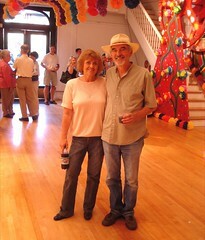 Artists Jerry Wray and Mary Virginia Hill will speak. Both have new work in the Experiments show. Wray returned from a summer sojourn at Lake Bistineau with a number of non-representational pieces smoldering with color. She will discuss the intuitive and experimental ways in which she continues to create compostions in her 6th decade of painting. Mary Virginia Hill brought inspiration for many of her new pieces from a visit to Normandy, says the artist's husband, Kevin Hill. 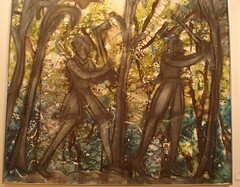 Struck by the characters in the Bayeux Tapestry the artist has peopled new canvasses with figures that emanate from the forests along the coast of France. 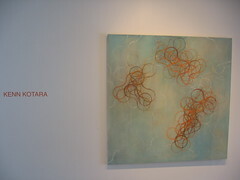 On Tues, Feb 19, 4 pm, Tama Nathan will present a gallery talk in Mainspace at Artspace. Nathan is also a well-traveled artist. 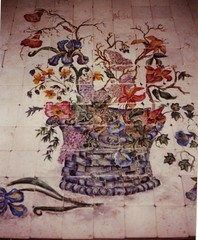 She has gathered materials for her sculptures as well as ideas for her work from global travel. "Expertly merging the mystical and the mundane, Mr. Ray presents a warm and well-rounded portrait of his subject, his Buddhist philosophies and the painful circumstances of his exile to a modest monastery in Dharamsala, India," says the NY Times in a very positive review of the 2006 documentary 10 Questions for the Dalai Lama. Centenary Film Society brings the 85-minute film to Jackson Hall on Tues and Thurs at 7 pm, for no charge. Valentine's fare? Hm. You could do worse, much worse, in this town. 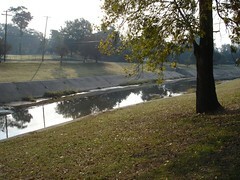 Shreveport's Gilbert St canal? ditch? bayou? The blog's subtitle is "Greenways, Linear Parks, Bike Paths, and Bayous to Use." "Leaving the bayous as they are, increasing access, and putting a path down the side" is being discussed by his correspondents as one of the chief enhancements for walking in Shreveport. A proponent of that idea is Sharron Swanson, an urban planner at Morgan Hill Sutton & Mitchell Architects. Demerath has been looking at a different plan: making a pavement cover over the bayous so as to create a broad byway. To Swanson's alternative he says, "My concern has been that it wouldn't entice as many people to use it as would a wider pedestrian street laid over the top of the bayou." Demerath tries to demonstrate a utopian version of the town almost every day. He walks his 2 children to school at Montessori School for Shreveport (corner of E. Washington and Galloway), starting near the Centenary Gold Dome. 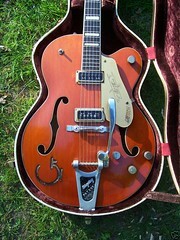 Some days there's a songster's guitar slung round his shoulder. His bigger point is to stimulate thinking about enriching life in Shreveport in easy and natural steps. Under his purview are developing conversations about bicycling to work and the store, building community gardens, revitalizing downtown and increasing our Social Capital. See more at another blog of his, A Better Shreveport. Sitting in on initial meetings are wizened community activists and some fresh muscle. Among the early invitees: Murray Lloyd, Jeff Welborn, Leia Lewis, Brad Armstrong, Dorothy McDonald, Charles Gerard, Jon Soul, and Shelly Armstrong. Say hello to Demerath at ldemerath@gmail.com. The Gilbert & Sullivan Society of North Louisiana (G&S) announces auditions for the musical production I Have a Song to Sing! 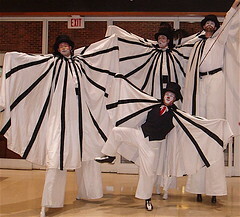 -- an original production with performances in Shreveport and Texarkana in late June, 2008. Singers and Dancers are needed, says John Godard. Auditions in Shreveport will be located at Anderson Auditorium, Hurley School of Music, Centenary College on Sun, Feb 24, from 2:00 to 4:00 pm. Auditions in Texarkana will be located at Choir Room, Stillwell Humanities Building, Texarkana College on Tuesday, February 12th, 2008 from 4:30 to 6:00 pm. 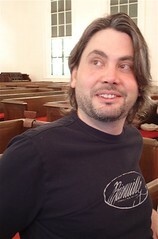 Music director is Marc-André Bougie. Stage Director is John Goddard. A variety of non-singing and singing and dancing roles are available for individuals ages from 14 to 60+. A British dialect for speaking parts is encouraged. Chorus roles with minimal staging requirements are available for individuals with limited time to devote to staging rehearsals. Contact Marc-André Bougie at mabougie1@yahoo.com to reserve an audition time. Shreveport Little Theatre, 812 Margaret Place, Shreveport. Class limited to twelve students. Mary Thoma Workshops @ mmatters3@bellsouth.net to confirm. Payment: Shreveport Little Theatre, (318) 424-4439, or in person by Feb 22 at 4 pm. SLT Office hours are 12- 4 pm / M- F. When registration is full, SLT will take names for a waiting list for the next round of workshops. The Designer Consortium is looking for new talent from the area, especially in the field of fashion / accessory design and art / photography, says Jane Ryder. She reports that "We currently have three fashion designers (covering day/evening fashion, lingerie and accessories), three jewelry designers (one vintage), one mixed media designer, soy candle designer, and pet couture and beds. We are also offering custom sewing, sewing lessons, and alterations. 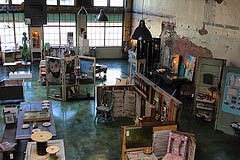 The store can also be used for private appointments, art/photography exhibitions, fashion trunk shows, etc." "Please call me if you know of anyone you can recommend, or please ask them to call me at 861-3111 at the store or my house 688-1299." Designer Consortium, 208 E. King's Highway, is across from Counter Culture. 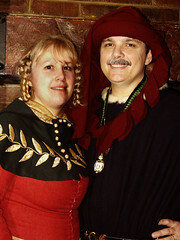 Activities include medieval war combat and archery as well as Arts and Sciences displays during the day. "At 7 o’clock a Medieval Banquet will be held and I will be dancing at the banquet," says Copeland. The Shire of Ardanroe site explains events, fees, schedule and exact location. There is also a murder mystery for the entertainment of all: "It is the 12th Century. The little town of Ardanroe has opened its gates for the Winter Faire before the Lenten season starts. All are welcome to compete for prizes and favors from this secluded town on the Welsh border. But wait! Not all is as it would appear. The Miller's wife has been found in the river wheel that powers the mill. Why was she killed? Help the wives of the mayor, the butcher, the baker, and the sheriff solve the mystery and catch the killer. Learn the clues revealed in classes, contests, tourneys, and the 'townspeople' working the event." Note: The illustration above does not capture Elizabeth Copeland, but simply endeavors to set the tone for an SCA tourney. After fighting for almost seven years for the Cajun/Zydeco category to be placed in Grammy voting, Terrance Simien is among the front runners to win the category. Well, the singer and squeezebox player has spent some 26 years touring and making albums, says the Opelousas Daily World. Simien's Live! Worldwide CD is among the seven nominees for the first zydeco/Cajun Grammy, which will be issued at the 50th Grammy Awards on Feb. 10 at the Staples Center in Los Angeles. Recordings by the Pine Leaf Boys, Geno Delafose, Roddie Romero and the Hub City All-Stars, Racines, Lost Bayou Ramblers and Lisa Haley are also in the running. A native of Mallet in St. Landry Parish and resident of Lafayette, Simien has spent the last 26 years traveling the globe playing a fusion of zydeco, rock, soul, blues and more. Through the years, Simien, 42, has shared the stage and studio with Paul Simon, Los Lobos, the Dave Matthews Band, Stevie Wonder and others. His Live! Worldwide disc features recordings from shows done over the past decade in Chicago, New York, New Orleans, Cuba, Australia and Mali, West Africa. The Grammy addition has spurred a new sense of involvement in the awards by Louisiana's music community. Thurs, Feb 7, at 2 pm, Lt Governor Mitch Landrieu and Mayor Cedric Glover will have a news conference to invite North Louisiana to share in the excitement. They will speak from Shreveport's historic Municipal Auditorium. Zydeco and Cajun musics are a product of French fiddlers and singers working alongside African-American fiddlers and singers. Amedee Ardoin, a legendary black Creole accordionist and singer, helped lay the foundation for modern Cajun music in a series of recordings made between 1929 and 1934 with the great Cajun fiddler Dennis McGee, says cajunfrenchmusic,org. 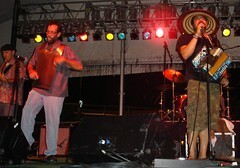 Props must be extended to Shreveport's masterful Mudbug Madness festival for bringing Simien and other great Cajun and Zydeco acts to North Louisiana annually. Please join Jim Huckabay and myself, says Bob Jordan, for a concert in the All Souls Unitarian Universalist social hall from 7:00 to 9:30 pm on Friday, Feb 8. We will do our mix of old-timey, bluegrass, Celtic, and contemporary folk, but also expect more than a few tunes celebrating Mardi Gras and New Orleans old-time jazz. Despite our group's name, the Recliners, most of our tunes are, as Barbara Jarrell puts it, "peppy." Come enjoy an evening where you can actually hear the music and maybe sing along in a pleasant, nonsmoking environment. Suggested donation is $10.00 for adults, $5.00 for children 12-17, free for children under 12, and no more than $25.00 for a family of whatever size. 100% of proceeds will go to All Souls. All Souls is located at 9449 Ellerbe Rd., Shreveport. For directions call the church office at 868-3313 or go to the web site at www.allsoulsuushreveport.org . There will be refreshments and a cash bar. 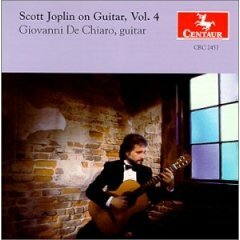 Red River Radio Network will be presenting American classical guitarist Giovanni De Chiaro in concert Valentine’s Day. De Chiaro will entertain in the LSUS University Center auditorium, 7:30 p.m., following a 6:30 p.m. champagne reception. “This is an intimate concert event with Giovanni De Chiaro,” said Kermit Poling, general manager of Red River Radio. De Chiaro made his New York debut in 1976 in a Carnegie Hall performance which brought a rave notice from the New York Times and launched a career of growing distinction. He has given concerts throughout the United States, Mexico and Europe and has performed for Pope John Paul II at the Vatican in Rome. His recordings include his arrangements of Christmas carols, Broadway classics, and the complete works of Scott Joplin. Performances by De Chiaro are regularly heard on public radio stations throughout the country. Tickets for the event are $15 each, $25 each to include the champagne reception with De Chiaro prior to the concert. A limited number of $5 student tickets are available. 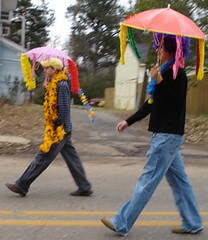 Shane Bevel and Jim Hudelson, both photographers for the Shreveport Times, have transmagnified the 08 Krewe of Highland parade in a video called Mardi Gras Whimsey. It's on youtube.com at shanebevel. Streaming dancers, pretty girls, flying beads and a cam mounted above the hard-working riders of the Cheers float form the body of the video. Their use of live parade music from the Red & Black Brass Band of Grambling, La, shows the soulful side of the 2 photographers. Bevel and Hudelson included the Blanc et Noir Marching Society, a ton of floats and a whole lot of the residents of Shreveport's beloved Highland neighborhood. It is a swank video by 2 guys whose creativity and wide-ranging imagination is hereby certified. 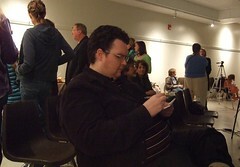 He is the Mary Jane Malone Lecture Series writer-in-residence for 08. Brockmeier will have seminars with Caddo Magnet scholars and address the student body prior to his 6:30 pm lecture. The evening talk is free and open to the public. The author will answer questions and sign books after the talk. 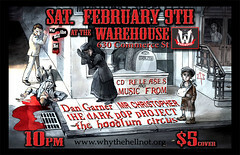 Why The Hell Not Music, aka Chris Alexander and friends, announces a multi-CD release event at The Warehouse, 630 Commerce St, in downtown Shreveport. The event will feature live music by The Dark Pop Project, The Hoodlum Circus, Mr. Christopher, Julez Dossett and Dan Garner. Why the Hell Not Music will also present the music release of each performing artist. A compilation CD featuring dozens of local and regional artists, as well as a CD release from Shreveport Guitarist Chris James will also be made available. In 2007 Why the Hell Not Music released 17 CDs by 13 different artists and will continue to help artists achieve their goals in 2008, says Alexander. One of the inspirations for the Blanc et Noir Marching Society was artist Bruce Allen and the many motley mosey-along walkers in the Krewe of Highland Parade. Low-key but witty, Highland marchers have been known to push lawnmowers and shopping carts. Bicyclists have sometimes provided balance to the Camaro crowd. Today the Krewe of Highland is the city's longest parade. Much of the length is provided by the arrival of floats from the other major krewes. Getting a second life from your Centaur float is an idea that works for both the riders and the watchers. Yet the spirit of Highland is found in the zany, the do-it-yourself and in small-scale wackiness. I mean, to me Highland is catching beads from one float then handing them to the people on the next float for an almost-instant recycling effort. Blanc et Noir is an over-the-top show in many ways. We are imitating black New Orleanians' benevolent societies' funeral customs. By our very nature we are a parody - a good-hearted one - of a distant and historic phenomenon. So you can laugh heartily when we shuffle past you. 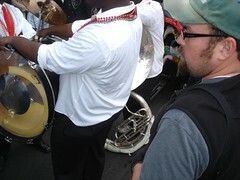 But you can also groove on the Red and Black Brass Band. This is what it was like when Carnival began in New Orleans. Indeed, the swells rode in carriages. Almost everyone else was on foot. If you want to shuffle with Blanc et Noir for a block or two, not to worry. Jump in and keep the spirit of Highland alive by your spontaneous combustion. Inter City Row Modern Dance Company and Louisiana Dance Theater join the Shreveport Symphony Orchestra for a program called Symphonic Dance at 7:30 p.m., Sat, Feb 9, in Riverview Theatre, says Scott Green. Selections include Weber / Berlioz’s Invitation to the Dance and Rachmaninoff’s Symphonic Dance. Inter-city Row Modern Dance Company will provide a visual dance interpretation of Nielsen’s Helios Overture, Op. 17 and LA Dance Theater will present movement to Piazzola’s Tangazo. Inter City Row Modern Dance Company is a company of four professional dancers, trained in Martha Graham and Lester Horton technique. The members are: Chastity Graham, Tanesha Butler, Tiffany Hayes and Kalie Coley. Carol Anglin is the founder and artistic director of Louisiana Dance Theater, a troupe which has received national honors on a sustained basis. Pro-rated season tickets are on sale now and can be purchased over the phone by calling (318) 227-TUNE (8863). Single tickets for “Symphonic Dance” are $10, $20, $30 and $36 with a special rate of $5 for students with ID. 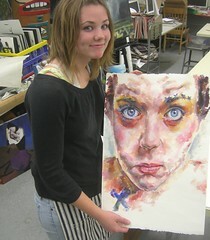 Says painter/photographer Tony Reans, "This is the first in what I'm calling my 'Held Dear Portrait Series.'" "The idea is that I'l come to my clients with portable photo equipment and take a black and white image of their hands holding something they hold dear, and then a color headshot or "regular" portrait-type photo of them. I'll talk to them to understand why this item is special to them, write a brief statement, and have all three framed together. The black and white will be 16" x 20" and the small photo will be 3.5" x 5", with the text box next to it the same size. I'll sign each one, and attach a certificate of authenticity. Makes a nice gift, too, so I have gift certificates available." Painter Mrs. Missy Jordan, member of the Hoover Watercolor Society and other art organizations, will be doing a demo on Yupo paper at Hobby Lobby on Mon, Feb 4, at 10:30 am. While it is a workshop for the Shreveport Art Club, Jordan says it is open to the public.